What do an Englishman’s desire for recognition in high society and a Russian adventurer’s longing for the comforts of home have to do with a winding country road that snakes its way across the Tualatin Mountain foothills? Well, brew yourself a warm cup of tea, find a comfortable chair, and read a tale woven with adventure, death, devastation, murder, hope, mercy and compassion, all occurring within a few miles of where I now sit. Almost every native civilization has been forced to accommodate invasive forces bound to possess its lands, and sometimes, even its people themselves. Native Americans living along the Columbia River were no exception, but no soldiers were needed in the invasion here. A population of 10,000 to 12,000 Chinook Indians from the Cascade Mountains to the mouth of the Columbia River was reduced to 2,000 to 4,000 by a smallpox epidemic transported overland from Missouri between 1782 and 1783. Research indicates it might have been the hemorrhagic form of smallpox that can be fatal in days. Stories abound of mass graves and deserted villages. With a mortality rate pushing 75%, the disaster that befell the peoples of the Northwest Coast from 1782 to 1784 was of greater magnitude, proportionally, than the worst killings of the Second World War, including the atomic bombs dropped on Hiroshima and Nagasaki. The horror of the experience entered the collective consciousness of the grieving survivors with such power and pervasiveness that the stories later collected by ethnologists are frightening even today. How could they explain such devastation with no information about germs and modern medicine? Thus, the wealthy, complex, and highly organized indigenous societies of the Columbia River system suffered setbacks from which they would never fully recover. The Multnomah Indians, part of the Chinook nation, inhabited Wappato Island (Sauvie Island), so named by Lewis and Clark for the edible plant that was pervasive there. A census by them in 1805 counted 800 people, with many showing the characteristic scarring of smallpox. The survivors of the epidemic may have considered themselves fortunate to sustain with the community they had left. Little did they know that lurking in an anchored schooner in the Columbia River was the end of civilization as they knew it. The source of their downfall was not above decks, in the white man’s determination to amass his fortune, but in the bilge below decks, in the form of malaria-carrying mosquitoes. From 1830 to 1833, malaria decimated remaining native populations along the river from the Cascades to the Pacific, down the Willamette Valley, and further south to the Sacramento River. The first white settler on Wappato Island, arriving in 1834, was Nathanial Wyeth. He wrote that malaria had “carried off to a man its inhabitants…Providence has made room for me without doing them more injury (by) killing them off…there is nothing to attest they ever existed, except their decaying houses, their graves, and their unburied bones, of which there are heaps!” This disease struck so quickly, and against so many, that survivors moved to be close to the British at Fort Vancouver, first for whatever medical treatment was available, but mostly so someone would be available to bury the final members of the tribe after death. The remaining Indians in our area, deprived of their community, survived as best they could in isolated living circles or by trying to assimilate with their British business partners. Nathaniel Wyeth had little chance to use the Indian trail into the Tualatin Mountains, as his expedition was fraught with ill fortune. With hopes of establishing a trading post, he purchased supplies and goods and arranged for their shipment around Cape Horn on the ship Sultana, as he proceeded overland from Boston in 1832 with a small group of men. Reaching Fort Vancouver, and subsequently Fort George at Astoria, he learned that the Sultana was wrecked at sea and all his trading goods were lost. His party promptly resigned, leaving him to return East to raise funds for another expedition. Wyeth was still enamored with establishing a trading post on Wappato Island, but was savvy enough to create a salmon packing operation so as to not directly confront the Hudson’s Bay Company’s (HBC) dominance in the fur trading business. The Columbia River Fishing and Trading Company was thus created, and Wyeth again sent a ship, the May Dacre, full of supplies with orders to stop in the Hawaiian Islands for livestock, plants, and 20 Hawaiian laborers. In 1834, he set out from Boston with 70 men and experienced the same trials and tribulations of his first trip, this time suffering the indignity of being swindled by his partner William Sublette. Wyeth and his party arrived at Fort Vancouver, and the next day the May Dacre arrived. The ship had been delayed in storms, was damaged, and arrived too late to capitalize on the spring salmon season. Nonetheless, Wyeth saw opportunity. He moored the ship to Warrior Rock on Wappato Island and unloaded hogs, sheep, goats, poultry, and a variety of plants. As long as he stayed out of the fur trade, the HBC allowed Wyeth to fish and trade in its sphere of influence. He explored the surrounding area, and found that the HBC had trapped out most of the native beaver and other fur-bearing animals. Wyeth focused on agriculture and fishing, but could only eke out a meager existence on the island. The Hawaiians deserted the camp early on, stealing most of his horses. There was a murder between the fort’s gunsmith and tailor over the favors of an Indian girl. Standing water on the island was a breeding ground for much sickness, and there was little food. As he wrote later, they were “living off of trash and dogs.” Many of his party died of “bilious disorders.” After the death of 17 of his men, and the desertion of many more, Wyeth abandoned Fort William and his dreams of wealth and prosperity in the Pacific Northwest, heading back to Boston and eventual success in the ice business. Wyeth’s efforts were not for naught, however, as the route he blazed through the Blue Mountains was to become part of the Oregon Trail, and one of his companions on the trail was Jason Lee, a missionary soon to become famous in the Pacific Northwest. 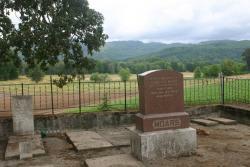 (Note: A stone memorial on Hwy 30 between Logie Trail Road and King Road shows the location of Fort William. In Europe, fine gentlemen, and those aspiring to become so, were in need of beaver top hats. This fashion started about 1550, and by the early 1600s beaver was extinct in Western Europe, and nearly so in Russia and Scandinavia. North America was to become the next source. Establishing itself first in Canada, the British HBC pushed further and further west in its attempt to secure beaver and other animal skins. Their expansion into the Pacific Northwest culminated in 1825 with the founding of Fort Vancouver. The HBC came to Oregon legally and in force. Governor Simpson administered a vast territory that stretched from Alaska to California to the Rockies. The entire Columbia River watershed came under the sub-jurisdiction of Chief Factor John McLoughlin, a 6’4” white-haired trader from Eastern Canada. Fort George at the mouth of the Columbia was abandoned in favor of Fort Vancouver, completed in 1825 five miles from the confluence of the Columbia and its major tributary, the Willamette River. The selection of this site was to establish a strong British presence on the north side of the river, which was assumed to be the probable future international boundary between British territory and the United States. Dr. McLoughlin was well respected, with a reputation for being wise, compassionate, honest, and an astute businessman. He recognized that the HBC should expand its focus beyond fur trading to include agricultural pursuits. As Europeans and Americans continued to settle the Pacific Northwest, the HBC supplied necessities and comforts to them, often offering supplies on credit, much to the consternation of his superiors, who were not happy that McLoughlin was aiding Americans that were settling in areas they hoped would remain British. In 1837, McLoughlin signed an agreement to provide Russian settlers in Alaska with eight tons of butter annually. As Wappato Island was an ideal place to graze cattle, McLoughlin established three dairies there. Cattle swam from Fort Vancouver to their new home on the island. The chief dairy operation was established at the ruins of Fort William, supervised by Laurent Sauve, whose name, with a variation or two of its correct spelling, was used thenceforth to identify the island. Despite the HBC’s best efforts, it was never able to completely fulfill the 8 ton butter commitment. Meanwhile, in 1839 at Fort Vancouver an enterprising young laborer, James Logie from the Orkney Islands in Scotland, was finishing his five year contract with the HBC and preparing to return home on its ship Prince Rupert. Once home, he decided to return to the Pacific Northwest, as he courted and then married 16-year old Isabelle Miller on the Orkney Island of Papa Westray. Logie signed a second five-year contract with the HBC as a laborer in 1840. Perhaps he was influenced by the wishes of the HBC’s London directors who were urging HBC men to marry European women to improve the “moral tone” at the Fort Vancouver depot, as most men were taking native and “half-breed” wives there. This experiment had limited success, as the “respectable English families of the labouring class,” as the directors referred to them, soon left the Fort to establish their own farms in the Willamette Valley or Puget Sound. The Logies’ neighbors, Jacob and Mary Cline, were so moved by Isabelle’s medical help in the birth of their daughter that they named the child after her, Isabelle Logie Cline. She was the first white child born on the island. James was well aware of the heavily traveled Indian trail across the water from the dairy. Climbing over the hills to the Tualatin Valley and eventually the Willamette Valley, he likely realized its great potential as a trade route, especially as a way to connect with the other company dairy located on Dairy Creek. Perhaps Isabelle also saw its worth as a route enabling her to continue ministering to the Indians living on the Tualatin Plains during the major epidemics of measles in 1847 and 1848, and smallpox again in 1853. The Tualatin tribe (also called the Atfalati) of the Kalapuyan Nation lived here and throughout the Willamette Valley. Having suffered an 80% mortality in the epidemic of 1830, there were still sufficient numbers living locally until the remainder were forced onto the reservation in Grand Ronde in the late 1850s. The census of 1910 reported just 44 Atfalati left on the reservation. Although there is no written statement of James’ intentions in improving the trail over the Tualatin Mountains, it is assumed in local lore that these were his reasons for making major improvements to the trail, probably widening and straightening it at least enough to transport a small wagon or his wife’s carriage. From this time on, the trail bore his name. The Logies’ world changed dramatically in 1846 when the international boundary between British and U.S. territory was established not at the Columbia River, but at the 49th Parallel (today’s boundary). The HBC soon vacated Fort Vancouver, now in American territory, and moved north into British territory, establishing Fort Victoria on Vancouver Island. The Logies were faced with a decision to abandon their island home and align their fortunes with the HBC, or to apply for U.S. citizenship and file a land claim of 640 acres upon which the dairy was located. The choice was easy for them to make, and propitious. It might be assumed that the surrender of Fort Vancouver to the Americans was a terrible blow to the business interests of the HBC, but fashion was on its side. Just about this time, a London haberdasher named John Hetherington designed, fabricated, and wore into the streets a silk covered variation of the contemporary beaver riding hat. There was initial resistance to Hetherington’s silk “topper” but once Prince Albert started wearing the new fashion in 1850, fine gentlemen abandoned their beaver hats, and the beaver trapping industry in America was decimated, almost overnight. For the Logies in the early 1840s, company was provided by a few settlers on the island. There are accounts of a large and well furnished home, and picnics, horseback excursions, dances, and other entertainments were regular features of life at Fort Vancouver, just a quick boat ride away. A weekly Portland newspaper carried a story about the HMS Modeste arriving at the fort, converting itself into a theatre for the production of contemporary plays: “Mrs. James Logie was in attendance, along with many other wives of importance, dressed in their most fashionable finery. Captain Baillie, the following day, organized picnics on the Island (the “dairy plains”), transporting his guests to the “big lake” on forty horses”. But when the Fort closed in 1846, that opportunity for socialization underwent a transformation. The Logies were childless the entire fourteen years of their marriage. Life then must have centered on the dairy, which had become theirs by default when the HBC abandoned it, and later, by land claim; and on Isabelle’s work as a nurse. In 1849, James caught the “gold fever” and bolted for the fields in California, leaving 25 year old Isabelle to manage their operations on the island. One account has him absent for almost three years, returning in 1851 and finally filing for U.S. citizenship. He did not return rich, however, but with enough money to finance a trip home to the Orkney Islands for Isabelle. She spent a short time there, and disappointed in all of the changes that had occurred in her absence, returned to America and her home on the island. In 1853, census records for the Logie homestead listed one male over 21 years, two males under 21 years, and two females. The younger men might have been visitors, or workers for the dairy. The whereabouts of another most important man in Isabelle’s life, Jonathan Moar, is a little obscure. A former HBC blacksmith, Moar, also a Scotsman, returned from the Indian wars on the Rogue River in 1853 and settled on the island. He was too old at that time to be considered one of the young men living with the Logies, but soon became an assistant to James in the dairy operation. Moar was there when James fell ill from typhus. He swam a horse across the channel and rode into Portland to obtain medicine and a boat to make the return passage, but arrived too late to save James. On April 14, 1854, James was buried on the island, having lived only 40 years. Life without a husband was not something to be desired for a young woman in a wilderness area. Isabelle Logie quickly re-filed her land claim after James’ death to comply with the new Donation Land Act, and four months after his death married Jonathan Moar, who had assumed management of the dairy. She gave birth to five offspring in the ensuing years. She lived 18 years with Jonathan and their children, and passed away April 29, 1872 at the age of 49, one of the most beloved of all the settlers of Sauvie Island. With the death of James Logie and the Fort Vancouver business pursuits abandoned, it would seem likely that his road might fall into some disrepair. That portion that ran from St. Helen’s Road to Skyline probably suffered the worst, since the elevation gain is 1200’ in 2.5 miles, very steep for loaded wagons to maneuver as they traveled to the railroad depots. “We find that the present road was surveyed many years ago following along an old Indian trail. Grades and alignment were evidently thrown to the winds at that time. The few settlers were pleased to even get a trail. But today, a large and growing settlement are forced to haul up and down the Trail, with grades varying from 12 to 20%”. His solution was to relocate the road “along the south slope of the ridge, thus allowing the sun a full sweep, making it a dry road instead of the wet and steep road now in use”. Improvements continued, and the county roadmasters map for March 1926 even indicates that Logie Trail was covered by macadam up to the last .2 mile; or, at the end of county owned timberland, to be more exact. The last major construction and repair on this lower section was completed in l940, probably accounting for the road we travel today. Logie Trail, once it reached the crest of the ridge, turned north, following the ridge, until reaching what is now known as Johnson Road. Logie turned westerly here, (as road 654) to the point of its intersection with what was to be named Pederson Road, (road 630). It then continued as Logie Trail southwesterly to the Washington County line, and past there to an intersection with Helvetia Road, continuing south into the North Plains area. Skyline Road continued along the ridge (road 407), but stopped shortly after the junction with road 654, not reaching Rocky Point Road until years later. On March 23, 1934, the Multnomah County Roads Department funded a project to improve, widen to 60 feet, grade, and update Logie Trail (the upper portion), combining all of these portions of roadways into county road 1323, Logie Trail Road. The introduction written for this project is quite interesting. A little unsettling is the reference to “Peter” Logie, but hopefully, the remaining is historically accurate: “A trail was opened along the route of this road by Peter Logie of the Hudson’s Bay Company about 100 years ago, running to the “Horse Ranch” of the fur company northeast of the old town of Glencoe. This trail became part of the California trail of the Hudson’s Bay company, and pack trains containing as many as 600 animals passed over it on the way to Southern Oregon and California. The U.S. Land Office plat of 1854 shows it as “Old Logie Road or Trail”. The first county road on the Logie Trail was established in 1883, as Road No. 327, extending from St. Helens road to the County line." On April 19, 1934, the upper section of road became recorded and officially know as Logie Trail Road. It continued as such through Washington County, until it’s junction with Helvetia Road. Logie Trail Road is shown in the 1936 Metzger map as an improved road from St. Helen’s Road, to Skyline, to what is now Johnson, then southwest to the Washington County line. So where did the name Johnson Road come from? Well, one clue is that the new Logie Trail project in l934 passed through the properties of 7 people by the name of Johnson. Perhaps more revealing though, since the 1936 Metzger County map still had the road names as originally registered, was the fact that seven large parcels of land had been purchased by the Skyline Land Company between 1927 to 1936 that had no immediate road access to Skyline, Logie Trail Road, or Rock Creek Road; in other words, they were landlocked.. Through some mysteriously propitious event, Beck Road was constructed in 1937, allowing access to those properties. The l944 Metzger map then shows the change of Logie Trail Road to Johnson Road, and the addition of Beck Road to the mix. According to the county road jackets (one for each road), both Logie Trail Road and Johnson Road (the same road) were established and certified on April 19, 1934 as county road 1323. Some maps even show both names. A recent driving excursion on Sauvie’s Island illuminated some of these long-passed events. The Sauvie Island Lavender Farm sits on the one-acre parcel set aside on the Moar property for the Logie/Moar one room schoolhouse. The proprietors are friendly and love to share the history of the island. As you continue down Sauvie Island Road, approximately three miles from Bybee Park, you see a roadside historical sign showing the location of Fort William, which of course sat on the Logie/Moar land claim, near its northern boundary. Not far from there, under a large Oak tree in a tiny pioneer cemetery, rest the bones of James and Isabelle Logie, their gravestones still standing and legible. Knowing the challenges they surmounted during their living years, we can only hope they were also able to savor the idyllic peace of their beloved island. One of the Moar progeny lives on the island today, according to a local resident.